from a Romance Author’s Point of View? Recently, I ended up on a Facebook thread about why the movie Dirty Dancing is so damn watchable. I can admit, I’ve seen it many times because it used to play regularly on cable TV. But until this weekend, it had been years. With my hubby out of town for work, I decided to give it another look to see if I could understand it’s ongoing appeal. Now that I’m a romance author, I look at every movie (and read every book) though a different set of eyes. A story has to be incredibly compelling and well-told for me to stop analyzing the plot, character arcs, inciting incidents, black moments, beats and whole bunch of other stuff I knew nothing about when I first watched this film. After binge watching it three times (though I was multi-tasking during the third viewing), I can honestly say Dirty Dancing still holds up. Almost thirty years after it first came out, this movie still has an undeniable appeal that’s made it a favorite for decades, despite a few cheesy lines and scenes. 1) The societal changes happening at that time mirror Baby’s (Jennifer Grey) personal changes, and underpin her awakening to a world that is ultimately different from the one she was raised in. Everything in the movie is on the cusp of change, from the politics, to the race relations, to the popularity of the resort itself—not just the characters. And change is what makes a story compelling. We can see the changes coming and we want to know what happens next. 2) Baby goes from a girl to a woman in more ways than one. Yes, this is a love story, and the lead character loses her virginity, but it’s so much more than that. Baby ends up questioning her entire worldview, along with her view of herself and who she longs to be. Not to mention how other people see her, and the people around her that she comes to care for. 3) Baby has agency. She’s a smart girl with her own ideas. Things don’t just happen to her in the movie, she makes things happen. Her moral code insists she has to help those in need if she can. So, she does, naively, not knowing the can of worms she’s about to open. Most of what happens in the movie is the result of her choices, for better or worse. We, the viewers, are quickly hooked. 4) Patrick Swayze, who played Johnny, was a beautiful man and an underrated actor and dancer. He’s the kind of man every woman wants to be with, on the dancefloor and off. His charisma in this movie is undeniable. It’s easy to see why Baby crushes on him, and why that crush becomes something more. 5) The way Baby and Johnny relationship develops is believable. It’s not just that he’s good looking, and she’s a stupid young girl who falls for the hot guy from the wrong side of the tracks. They get to know each other slowly, and go through challenges together. You can see his attraction to her growing at the same time her initial crush becomes something deeper and more solid. He’s in awe of the way she’ll give up so much to help someone else, and she respects his commitment to Penny and his efforts to better himself. It’s not just about looks or lust. 6) The characters are multi-dimensional, and grow and change. The hardships and adventures that bring them closer also make us root for them. In the end, because of their journey and their relationship, they both become better versions of themselves. Something we all want from our relationships. That character arc is key to a successful story. 7) Both main characters take risks for each other. In the black moment at the end of the movie, Baby puts her reputation and her relationship with her family at risk to save Johnny’s job. And Johnny realizes he has value. That he does have something to offer the world, and her. He isn’t just “nothing”. When Johnny shows up in the finale, and asks her to dance, he’s proving that both of them have value, and that their relationship and their choices are not wrong. On a side note, the music and dancing is irresistible. My father was a child of the fifties, so I grew up listening to that music. The soundtrack perfectly encapsulates both the time period, and the problems and changes the characters go through, despite the suspension of disbelief required for the modern, signature song, “Time of My Life”. 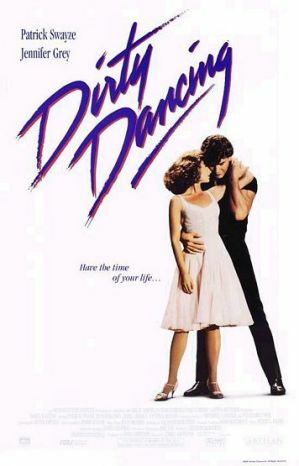 What do you think about Dirty Dancing? How many times have you watched it? What do you love, or hate, about the movie? Let me know by leaving a comment below.